‘TransLink 2017’ is a six-part Daily Hive end-of-year series on the state and future of Metro Vancouver’s public transit system, based on our recent extensive interview with TransLink CEO Kevin Desmond. Part 5 discusses Desmond’s thoughts on the Canada Line and the lessons learnt from this under-built train system for future projects. Yes, SkyTrain’s Canada Line is definitely under-built. And with its immensely short 40-metre platforms only slightly longer than two articulated B-Line buses put together and the small station circulation areas, even the CEO of TransLink is admitting the system’s shortcomings and the lack of foresight with the project. Of course, the decision-making process behind the Canada Line’s design came long before Desmond took on his role with TransLink. The controversial project was the first public-private partnership for a transit project in Canada, and it had to be built in time for the 2010 Winter Olympics. “The lesson learnt with the Canada Line is you have to think of these infrastructure assets as 50 to 100 year assets. If you choose to make decisions to spend less now, at least go into it with your eyes open,” said Desmond. 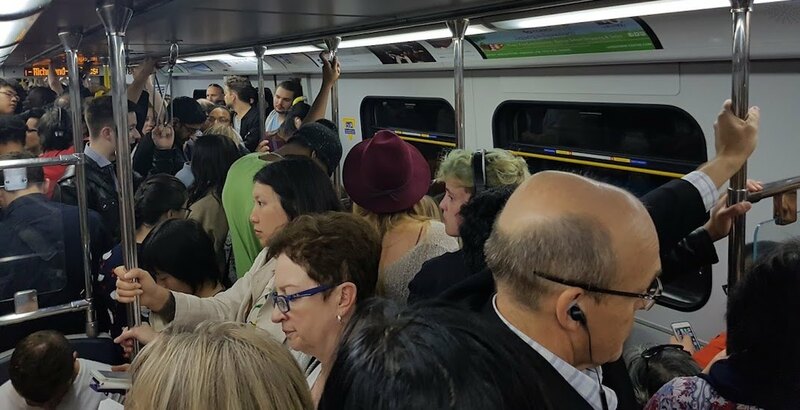 In the meantime, there is still some room to grow the Canada Line’s capacity by simply adding more trains to increase the frequency. Desmond says 22 cars that will operate as 11 two-car trains will arrive in 2020, effectively increasing the system’s capacity from its current 6,100 passengers per hour per direction (pphpd) to about 8,000 pphpd. 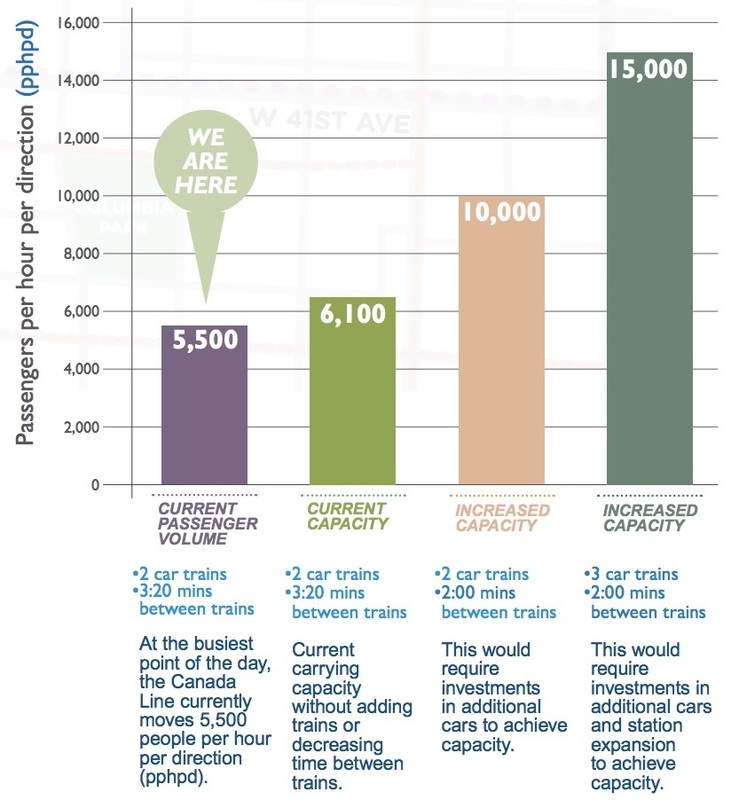 He estimates the method of increasing capacity by only adding more trains will be sufficient to meet ridership demand for another 10 to 15 years. All of the platforms can be slightly extended to 50 metres, which is a length several major stations have already been built with, to allow for the future operation of a longer train with a shorter third middle car. This will take the Canada Line to its ultimate design capacity of 15,000 pphpd – the same current operating capacity of the Expo Line during the peak periods. SEE ALSO: Short platforms and trains – Is the SkyTrain Canada Line under-built and near capacity? But the ultimate design capacity of the Expo and Millennium lines – with longer 80-metre long platforms – is far higher at 25,000 pphpd, and such a high capacity permits the flexibility for major urban growth around the stations. Desmond said planners 15 years ago underestimated the potential ridership of the system, and the potential for transit-oriented developments both planned and unplanned. 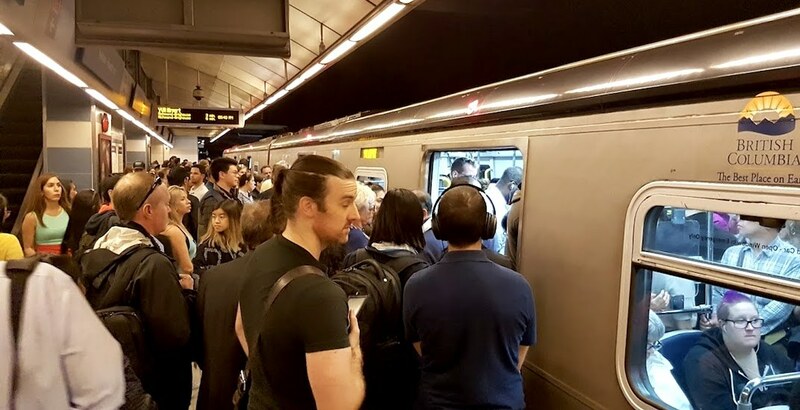 Ridership reached the 100,000 daily mark, the threshold to break even on the system’s operating costs, in the first year – four years ahead of forecasts by planners. Today, ridership is hovering at over 130,000 per weekday. Desmond says that TransLink and other government bodies need to learn from the pitfalls of the Canada Line for future projects. This begins with projects like the planned Broadway extension of the Millennium Line from VCC-Clark Station to Arbutus Street. He says the system will not be under-built as it will be a continuous extension of the Millennium Line, following the same platform design standards of the Expo and Millennium lines. Eventually on the Expo Line, there will be six-car Mark I trains and five-car Mark III trains – the newest trains on the system. Similarly on the Millennium Line, there will be a need to go to four-car trains eventually. Despite the shortcomings on its designs, Desmond says the Canada Line is still a “fabulous investment” and he does not believe the project could have been built in any other way at the time.